Kunsthalle Basel is dedicated to exhibiting, discussing, and reflecting on the art of the present. And it always has been, since its founding in 1872. 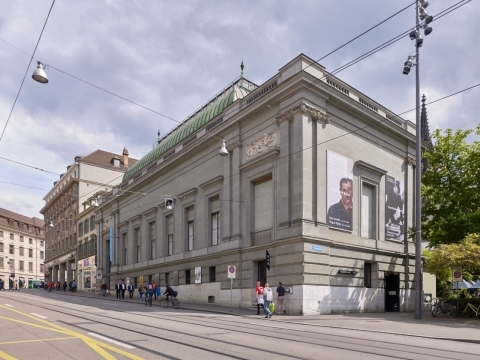 It was one of the first institutions in Switzerland to feature international and Swiss contemporary art, and today it is still among the country’s most active. It is renowned for its audacious and varied programs as well as for its engagement with artists, particularly those who are not yet widely known. It welcomes curious visitors of all ages and organizes up to 10 thought- provoking exhibitions per year, many of which include newly produced works. It also hosts a panoply of events — artist’s talks, performances, film screenings, and more — making it a vibrant site to experience contemporary art and take part in the discussions that surround it. Hong Kong-based artist Wong Ping (* 1984) makes captivating, colorful animations and installations that seem playful and light, but actually portray our contemporary urban condition with wry, dark humor. At once tender and unsettling, the performances of Geumhyung Jeong (*1980) are studies in the erotics of technical animism. For her first solo exhibition in Switzerland, the South Korean artist and choreographer creates a new performance accompanied by a related film and sculptures that use DIY toy technologies, amateur robotics, and programmed movements to undermine the boundaries between desire and control, human and machine, animate and inanimate. Inspired in equal measure by science fiction, cinematic staging, and the overwhelming hybridization of nature with the human-made, the Croatian-born artist turns the exhibition into a reactive biotope. The result is a disquieting exhibition experience, with artworks whose unfolding forms are modulated by invisible forces. Basel-Stadt art credit (Kunstkredit Basel-Stadt) presents works by artists who were awarded the individual artist’s direct grant by the commission of Basel-Stadt art credit in 2018. For her first institutional solo exhibition in Europe, Kaari Upson (*1972) presents a new body of wood and latex sculptures that continue her ongoing exploration of both the figure of the mother and the uncanny double. The Polish-British artist and choreographer Alex Baczynski-Jenkins (*1987) deploys micro-gestures, dance, and minimal sets to trace desire, alienation, and collectivity. His practice is specifically concerned with the mediation and politics of queer desire, staging affect and intimacy through live performance. The black-and-white photographs and films by Joanna Piotrowska (*1985) capture the everyday drama of human relations. The Polish artist creates inexplicably strange and touching images, whose recording of gestures of care, self-protection, or control are as deftly composed as they are psychologically charged. For the 20th edition of Regionale, Kunsthalle Basel celebrates the origins of the tri-regional, multi-institutional collaboration by inviting former Kunsthalle Basel director Peter Pakesch, one of the initiators of Regionale, to curate the annual exhibition of work by artists from the region. CHF 12.- / 8.- inkl.